Twenty-two years ago my husband John and I married with two ceremonies: a December Methodist Blessing ceremony in his hometown and an Episcopal wedding ceremony five months later in Austin, Texas. Did our personalized interfaith wedding raise some eyebrows in my traditional Catholic family? Certainly. Did we enjoy our tailored celebrations and ceremonies? Absolutely. 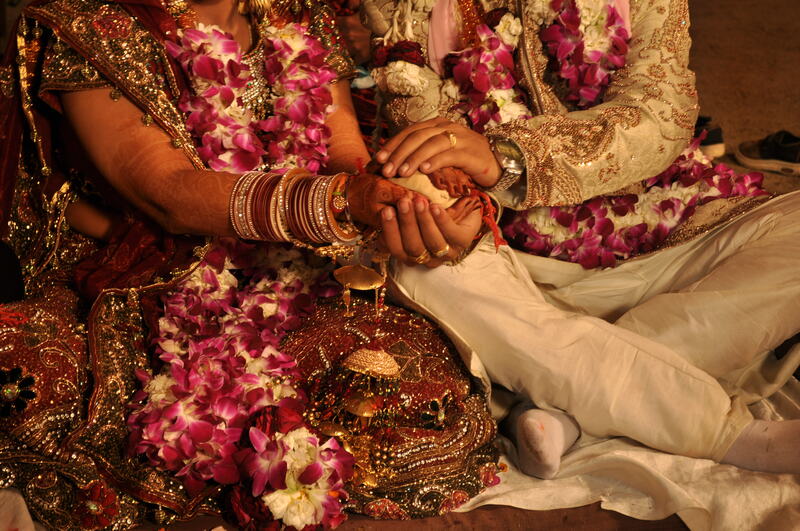 Indian wedding ceremony with the bride's hand in the groom's. Today, receiving a wedding invitation for a Catholic bride and a Hindu groom for an intercultural or an interfaith wedding is not unusual, and stirs anticipation for a splendid affair! Couples from different faiths and cultures have the opportunity to bring tradition from both backgrounds to the wedding festivities. When you take a closer peek into wedding customs and belief systems, you'll discover surprising similarities. Did you know that in the Greek Orthodox, Hindu, and Jewish belief systems it is customary to break an item at the ceremony's end? Greek tradition is to drink from a wine glass and toss it! Jewish vows include the groom stepping on a glass, while Hindus crush a pot. Jewish tradition calls for marriage vows to be held under a chuppa while in Hindu culture, vows are held under a mandap -- the symbolism represents the couple's first home. 1. Keep Communication Open. Create and encourage open communication with both sides of the family early in the engagement. Discuss the planning process and select certain traditions from each culture that you and your finance' wish to highlight. Having an awareness of customs and showing parental respect goes a long way, especially when families are paying for the wedding and will become your new extended family. 2. Compromise. Graciously coordinate with both families. Respectfully state that although this is your wedding, you plan to honor important customs of both families during the wedding. Summon up your best diplomacy skills, compromise and remember: you can't please everyone, all of the time. 3. Premarital Counseling. In any marriage, pre-marital counseling is worth its weight in canary diamonds! Spirituality, belief systems, budget, children, boundaries and career aspirations should be discussed before and during the engagement. 4. Licenses & Prerequisites. When planning a ceremony in a church, mosque or synagogue, you must obtain special documents, attend classes, and follow specific protocol to receive approval. If you are planning the ceremony in a park, garden or on a lake or beach, special licensing will be needed. 5. Location. Location. Location. Select carefully. Read, understand and keep a written copy of the contract and rules of conduct. Provide the location's event coordinator with written notice of your intercultural ceremony details to prevent confusion on the big day. 6. Two Ceremonies. If your cultural backgrounds are too elaborate or too different to combine into one ceremony, consider holding two wedding ceremonies like we did. 7. Personalize your Ceremony. Many religious officiants are more than willing to conduct the ceremony jointly and provide creative ideas to honor both traditions. Due to the combination of more than one belief system, time the rehearsal to be sure the ceremony is not too long. Provide seating at the wedding! 8. Custom Explanations. Ask the officiant to provide a brief interesting explanation of ceremonial elements, or provide one in writing for guests. 9. Master Some Dance Moves! Enroll in traditional dance classes from your respective cultures 6-8 months before the big day and hit the floor with your love. Guests will be entertained and you will have a blast! 10. Personalize. Honoring family culture is important. Remember to showcase your own personalities. Customize a wedding playlist with tunes from your first date during Austin City Limits. Don't forget, this is your wedding celebration. Congratulations & Best wishes!